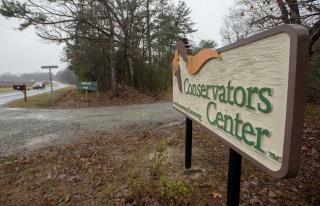 (Newser) – How did a lion at North Carolina's Conservators Center animal preserve get to intern Alexandra Black, fatally mauling her on Dec. 30? A witness tells authorities it was due to a blocked gate, according to a report obtained by WRAL. Animal trainer Ashley Watts says she separated the lion into a section of an enclosure, but the gate securing that section was obstructed by what is described by the Raleigh News & Observer as a "large play ball." Because of that, the lion was able to reach the interns who were cleaning another area of the enclosure. The lion grabbed Black before Watts could close the gate, dragging her by the ankle into the enclosure and killing her. Tell ya what. Let's agree that zoos are inhumane and repulsive. Release these wild creatures from captivity after ensuring that they have the innate skills to function in their natural environments. We have more than enough written, photographed, and videoed information to make sure we and our children are educated about these non-human animals. I live near the LA Zoo, which tries mightily to provide humane habitats for its "holdings," but there's no way a giraffe, elephant, or ape can function normally in an enclosure where humans are tromping through and yelling and hurling things at them day after day. Rescuing a fellow creature is good. Exhibiting a fellow creature in a cage is profoundly cruel and arrogant. Bible or no, these animals are not ours to dominate; they are our earthly brethren and deserve our respect and reverence. If we humans can't co-exist peacefully with these benign critters, the failure is ours. I recognize that the "fittest" will survive, but H. Sapiens easily can survive without harming fellow earthlings who pose no threat to us. Fight off a mountain lion or shark who has attacked you? Sure! Eliminate a rattle snake hiding behind the door in your garage? Of course! But capture and imprison a creature just going about its business in its own habitat? No, that's just evil. One main reason to not to enslave animals in zoos. To profit from an animal is abhorant and cowardly!